Wadi Rum is also an amazing experience for children. Of course a few things have to be considered, but in general it is no problem to arrange tours that are suitable for families. One possibility would be to take your children on a jeep tour. Usually you'll also get a discount for the smaller ones. We always enjoy having children with us, but please consider that you as parents have full responsibility for them and have to look after them at all times. Camel rides: Children up to the age of two years can ride on a camel in front of one of his/her parents for two hours maximum. Quite frankly, this supposes that the parent does not take up all the place on the saddle! If so, you should bring a "child bag" so that the child can ride on your back. Children from the age of 8 years onwards can ride their own camel on a leading rein for one day. We do not advise more than about 4 hours in the saddle and we also advise against more than one day, however enthusiastic the child may be. 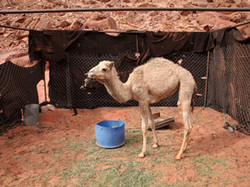 Go to our Camel Tour page to find your program. Hiking: You have to consider that our hiking tours are especially because of the heat very exhausting. The sun is out most of the day and the temperature lies usually between 28C and 35C. In addition to that we usually find ourselves far away from any vehicle. Hiking out in the hot weather all day should not be underestimated. The conditions are harder than most of our guests are used to, and it is not surprising that children tire more quickly here than at home. Please note that we cannot accept children younger than 12 years old for hiking out in the desert for two or three hours at a time. We would recommend families the program "Small Three Bridges" , which is designed for those who are unsure about how much they want to walk, and the vehicle is within reach for the whole time. For this hiking programme we also accept younger children. Our guides are always happy to help you out, but they must remain free and unencumbered in order to be able to react quickly in an emergency. For that reason they can not carry a small child while climbing. Go to our Hiking Tour page to find your program. Scrambling in the mountains: We do not recommend any program involving the mountains for children younger than 14 years old and refer here to the simpler scrambles. More difficult scrambles, such as the Rakebat Canyon, should not be attempted by children under the age of 16 because it is more difficult than it appears at first sight. Camel rides: For Children with an own camel it will be the full price as well. These descriptions are very general, which is why we see what we can do for you when you are here. 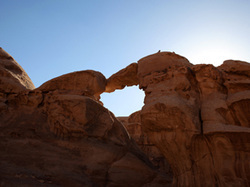 There are a number of possibilities to discover Wadi Rum. Look for our one day and two day programs and three and more day programs. You can find our general information about our tours here.